Get ALL USEFUL INFORMATION about bots in one free awesome repo on Github! Storyline – Create voice apps without coding via visual interface and ready-to-use templates. LPX Episode 7: Are chatbots the new apps? – A podcast about future of chatbots with Robert Stephens, a co-founder of a new chatbot service called Assist. Poncho – Poncho delivers customizable weather forecasts daily via email and text message, helping you plan everything from your commute to your outfit. It’s free! Swelly – Bot to provide the fastest way of asking questions and getting opinions by friends! TheScore – theScore brings you real-time sports scores and news from the teams you care about, with deep coverage of MLB, NBA, NFL, NHL and major soccer leagues! Qwazou Bot – A Messenger Bot that helps you discover new bots on Messenger. ChatbotProxy – Extensible proxy between your chatbot and providers. It helps debug incoming/outgoing requests using curl. And it keeps per page metrics for Facebook Messenger bot apps. Botmeter – Follow performance, optimize conversations and understand your customers’ behaviors through our analytics application. Chatbase – Analyse and optimize bot conversations. Visualize interaction flow, explore chat conversations, analyze retention and track convertions. Hunch – Hunch is your powerful but super simple analytics assistant that constantly monitors your marketing metrics. From answering AARRR funnel questions to automating your weekly and monthly reporting. Boim – Bo.im is gateway to all your channels. It can link to all of your bots, contact info, locations, websites, and much more, while behaving according to where it was clicked on. Messengerify – Messengerify will connect the website with your Facebook Page and provide a better chat experience for your customers. Even if visitor leaves your website the conversation can continue via Messenger. WhatsHelp – Messenger Marketing Platform for marketers and entrepreneurs. Grow your subscriber list, create smart bots, and broadcast messages in just a few clicks. cashbot.ai – Monetization platform for chat & voice experiences that leverages the rich context of conversation to make relevant, timely product recommendations which lead directly to sales conversions via mobile & traditional E-Commerce. BotPreview – Easily build previews of chatbot interactions. Sketch chatbot interactions using the BotPreview online editor and share them or export as static HTML or MP4/GIF video, without writing a single line of code! BotMock – Effortlessly Design Bot Conversations. Build customized bot conversations in under 5 minutes. Share them or export as a gif and video – without writing a single line of code! Cheap Bots, Done Quick! – Help you make a Twitterbot! They’re easy to make and free to run. BotMockup for Telegram – Superfast mockup-tool for Telegram bots! Totaly free. Construct and send messages to the sample bot and make screenshots. Chatbottest – ChatbotTest is an open source guide that helps you identify chatbot’s design issues under 7 different categories. Planeta Chatbot – A chatbot magazine originally created in Spain with the purpose of sharing the latest content about chatbots. UX of Chatbots – A curated list of resources to help you on your journey into the User Experience of Chatbots. BotMakers – The best place to hire chatbot developers. BotMakers Projects – A Facebook group with Chatbot Development projects curated by BotMakers. api.ai – Conversational User Experience Platform from Google. Build brand-unique, natural language interactions for bots, applications, services, and devices. PullString – Offers a professional authoring environment, hosted AI and machine learning runtime, and integrated conversation analytics to enterprises, agencies, and startups across verticals as diverse as entertainment, customer service, travel, automotive, health and fitness, finance, human resources, and IoT. BLiP – BLiP helps you serve, engage and sell through conversations on your site and app, Facebook Messenger, Workplace, SMS, Email, Telegram, Twitter, Skype and other popular apps. All you need to create, manage and evolve your chatbot on the same platform. bothaus.io – The Chatbot Augmentation Platfom. Build, enrich, deploy & monitor your chatbots and integrate with a range of services. BotEngine – BotEngine is a natural language understanding framework that allows you to create intelligent chat bot for any service that will communicate with customers. Morph.ai – Power of chatbots for your business. Recast.ai – Collaborative Bot Platform. Build your own conversational bot! Bottr – A bot is your smart digital avatar – it brings everything in one chat interface, learns by simply talking to you and represents you to the world 24/7! HemenBot – HemenBot is a bot building platform, you can create a messenger bot in a few minutes. There is free and paid plans. Interface is Turkish but bots can work any latin languages. Recime – We empower developers to quickly & effectively create serverless bots and deploy them across many channels at once. MachinaBot – A Smart Relay Gateway Designed for Bots. Coren – Coren allows both businesses and individuals to easily build & use chatbots to automate repetitive tasks, in an innovative way. JetLink – AI powered messaging platform for easy commerce and better support. Broid – Broid’s API enables bots & softwares to converse on more than 20 top messaging channels, including an interactive live chat (web & apps) powered by the best conversational features available. No more doc reading, coding and testing, leverage new channels with the flip of a switch on your dashboard. BotNation AI – Bot building platform for engaging voice and text-based conversational apps. CONVRG – Enterprise AI-powered chatbot and messaging experience platform providing personalized conversations that live on FMB, Kik, Webchat, Alexa and Google Home, integrates with CMS systems and E-Commerce platforms. Recime – A powerful platform for developers to build enterprise-grade bots. Recime provides the bot framework, developer tools, and a serverless cloud infrastructure. YveBot – The simplest way to build a smart and customized rule-based bot conversation. For Browser & Node. Bottender – Make Bots in Your Way, Fast and Flexibly. Telegram-Typings – A tool for parsing Telegram API page to the typings. Chatito – Generate datasets for nlu chatbots quickly using a simple DSL. Comparison: ManyChat vs Chatfuel – ManyChat vs Chatfuel in-depth review & comparison. Revenue models for bots and chatbots – In this article Amir Shevat from Slack has reviewed the direct and indirect ways that bots can drive revenue to a business. Chatbot Developers on BotMakers – 157 (and counting) chatbot development agencies from the United States, Ukraine, Canada, UK, Brazil, India, Germany, Israel, France, Belarus, Italy, Austria and other countries. NLP Bots – NLPBOTS integrate with your online product or service; web, intranet or mobile, to give your users an always available help feature via an intelligent chat-bot interface. NLPBOTS continuously learn from their interactions with users and give businesses the opportunity to analyse and build on product or service features that drive efficiency and engagement. Chatbots Agency – The Chatbots Agency helps you develop your digital communication designs! Turbo.ai – A bot for your business in minutes. BotCopy – A bot writing and design agency based in sunny LA. Bots Berlin – This group is about how to design and develop products for these conversational platforms using AI, machine learning and natural language processing. We’re in the early days of the “bot economy” – so let’s get together and make it happen! Alexa Accelerator – Offered in partnership with Amazon’s Alexa Fund, this program is designed to support early-stage companies advancing the state-of-the-art in voice-powered technologies, interfaces and applications, with a focus on Alexa domains such as connected home, wearables and hearables, enterprise, communication devices, connected car and wellness. Building Chatbots with Microsoft Bot Framework and Node.js – A book that provides a Step-by-Step guide to building chatbots using the Microsoft Bot Framework and Node.js. The book also discusses the underlying architecture and design principles for building chatbots. Building a Chatbot with Laravel and BotMan – “Building a Chatbot with Laravel and Botman” is a hands on guide to building your own personal chatbot. You’ll learn how to onboard new users, allow them to access your latest articles, push out new articles in real-time and respond to small talk. Bot Designers, Developers & Marketers – Facebook community where experts share information, tactics and strategies for designing, building, and marketing bots. Bot Academy – Facebook community for people interested in bots and Facebook Messenger Marketing. 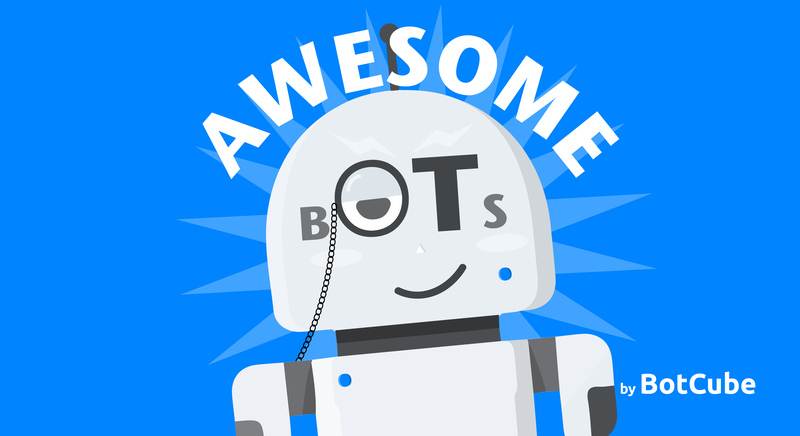 HHBots – This group was created to provide a place for people to talk about their favorite facebook bots, slack bots, or any kind of bots! Build Incredible Chatbots – The most comprehensive and complete bot developer course. Build & deploy chat bots for fun, business, and enterprise. Creating Bots in the Microsoft Bot Framework Using C# – Get started creating your first bot with a built-in template. Watch helpful demos to learn about the many ways of communicating with the user, beyond just text, that Microsoft Bot Framework includes. To the extent possible under law, BotCube has waived all copyright and related or neighboring rights to this work. ‹ API.AI “Small Talk” is now Open! Why is it a Really Big Deal?